Spring break is this week (as much as a preschooler who goes only two mornings a week can even understand what spring break is), Easter is over, and my spring updates have begun. I've retired my winter-white bedding for the season, fallen in love with touches of pink and copper, and I'm imagining all sorts of updates I can do in the house on-the-cheap. I don't know if it's cabin fever, but I've been feeling so restless lately! Not only do I feel like my home decor is getting stale, but I'm cleaning up a storm - I was even dreaming of cleaning the entire refrigerator last night, not a good sign. They do say "Spring Cleaning", clearly for a reason and maybe its not just because things are dirty. In the hopes of putting my craziness behind me, I've brought out my spring bedding, an ancient Anthropologie duvet cover and shams that I fell in love with years ago and just can't shake my love for. It screams spring to me, serene and calm. It's amazing how a quick trip to the linen closet can make my bedroom feel fresh and ready for great weather. Gotta love shopping my home! I did make a small investment to update the family room with pink accented pillows from World Market. 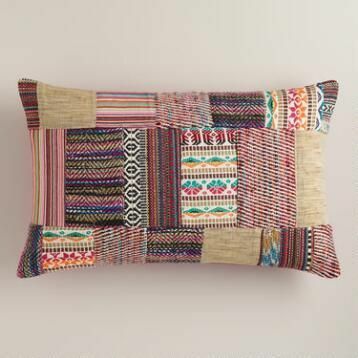 They have such a fun selection of pillows that aren't crazy expensive. On my pillow trip I even found a copper accented mirror for the family room. I'm not sure what has sparked my sudden desire to decorate with pink, but it feels much more fun than the browns I previously had and puts a smile on my face. My trio of frames in the kitchen have also gotten their seasonal update. They are the Ikea Ribba frame in walnut (unfortunately a discontinued color). The 12"x12" opening is perfect for scrapbook paper that I can change out whenever the mood strikes. They are red patterned Ikat, stripes and Chevron stripes right now. Another way I'm looking to freshen up the house it to search for wall art/decor for the master bedroom. I stumbled upon a great Elle Decor post about downloading free prints and framing them inexpensively. I hadn't thought to do this, LOVE IT! I'm also still hoping to get my paper towel roll art put together for above one of the dressers in our master bedroom; hopefully before my towel roll stash explodes out of the bag - I'm great at saving them, just not so great at getting my act together to use them! So, I have two good projects ahead of me. I'll keep you posted! Check out my Pinterest board for more spring updates that may just inspire you, too! Maybe it was residual winter clouding my brain, but I feel like I've been living under a rock the past few weeks - uninspired to do much of anything crafty or design-worthy. I had at least three projects I wanted to do for Easter, but didn't even break them out of the bag! So sad. I did grab two craft projects at Target that I could do with Toddler G. Thank goodness, otherwise my funk would have put a cloud on her Easter! Here's to being more inspired now that I feel like spring has arrived!